BY NOW most of us will have learned to keep our expectations low whenever a band – reunited for a fistful of dollars and a rush of nostalgia – unveils that dreaded ‘new material’. This week, The Libertines became the latest outfit to follow a rush of live shows with a studio attempt to regain faded glories. As much as we, the fans and the media, push a reformed band for new work, deep down we really don’t want to hear it. We don’t want to face the inevitable reality that, really, your favourite band from a decade ago just aren’t as good as they used to be. We’ve seen it before with everyone from The Verve to The Pixies, Dexys to Damien Rice. For all the good intentions and positive messages fed to the press, a group of musicians simply just can’t pick up creatively from where they left off. The best bands are all products of personnel, place and time. Remove a member or insert a lengthy hiatus and the creativity just don’t flow. The flame is gone. The magic is over. The moment has passed. And that moment is vital. Bands have their time, and when that time is done, it’s done. The La’s, Pulp, Whipping Boy, The Pogues, The Blades and The Stone Roses may have all triumphed with live returns, but they have had the good grace to realise that there is no point trying to reignite a burst of creativity that was captured a dozen years previous. Sure, not all material produced by returning groups or musicians is bad. Occasionally some of the big ‘comebacks’ will deliver a real gem, such as Blur’s ‘Under The Westway’ and The Pixies’ ‘Indie Cindy’, while smaller groups, such as Sleater Kinney or Afghan Whigs, have tended to fare better without the burden of mass expectation. 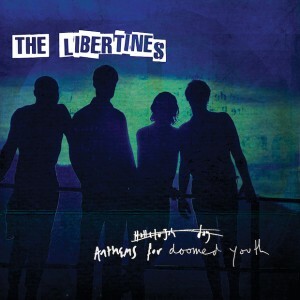 The Libertines – back this week with ‘Gunga Din’, their first new material in 11 years – will have firm judgement reserved until the release of their third album, Anthem For a Doomed Youth, on September 4. The signs, however, are not to get overly excited. While ‘Gunga Din’ comes armed with typically fine lyrics, duel vocals and a trademark melodic, yobby chorus, it nonetheless doesn’t hold a candle to anything on their classic debut, Up The Bracket, or even that albums b-sides and cast offs. It would probably have made the grade for their drug addled, patchy second album. Not awful, but not vintage either. The saving grace for The Libertines may come down to their stated realisation that they won’t be able to produce another Up The Bracket, and the fact that they have returned during a particularly dire period for British guitar music. When you see the likes of Alt J, The Vaccines, Catfish & The Bottlemen, Courteeners, The Maccabees and Wild Beasts high up festival bills, you know the scene needs a firm belt up the backside. Intriguingly (or oddly) Jake Gosling, best known for his work with Lady Gaga, Ed Sheeran and One Direction, has produced the new record. “It’s not us repeating ourselves, that’s for sure,” Carl Barât recently told NME. “We’ve definitely moved on.” As to whether the new record will contain dirty fast guitar tracks, ala their debut, Barât said there are only ‘nods’. Not part of our lives… forced… All thoughts that come to mind with reformation records of past. We can only live in hope that the need to produce something new in order to keep the show on the road wasn’t the only major consideration this time around, but the omens aren’t good.